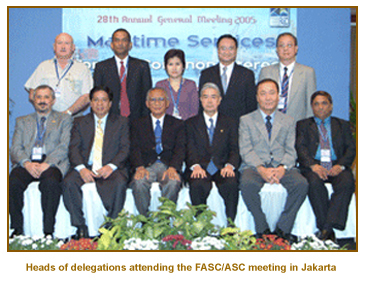 The 28th Annual General Meeting of the Federation of ASEAN Shippers’ Councils (FASC) and the 2nd Annual Meeting of the Asian Shippers’ Council (ASC) were held in Jakarta from 25-27 September 2005, hosted by the Indonesian National Shippers’ Council. The meetings were attended by 49 delegates of 12 shippers’ councils from Asia and South Africa. Present were members from Indonesian National Shippers’ Council, Malaysian National Shippers’ Council, Philippines Shippers’ Bureau, Singapore National Shippers’ Council, Thai National Shippers’ Council, Hong Kong Shippers’ Council, Korean Shippers’ Council, Macau Shippers’ Association, Shippers’ Council of Bangladesh and Sri Lanka Shippers’ Council. Observers in attendance were Japan Shippers’ Council and South African Shippers’ Council. The meetings covered a broad range of subjects including the Regional and Country Reports highlighting the member councils’ accomplishments and activities, issues of common concerns including the Terminal Handling Charge and other Surcharge problems, the Dialogue with Carriers, Maritime Regulatory System and Freight Transportation Security. The meetings discussed specifically the shippers’ pressing maritime concerns on escalating freight charges, and the increasing numbers and levels of surcharges. Likewise, the delegates expressed disappointment with the carriers for failure to consult shippers before the introduction and imposition of the surcharges, and further for failure to provide justification and transparency on items of surcharge services. The issues relating to THC and other surcharges have been long outstanding without any solution. The meetings agreed that other recourse should be taken by bringing the issues to the International Chamber of Commerce (ICC) for guidelines, and to the World Trade Organization (WTO) for a policy decision on the anti-trust immunity extended to the carriers. The meetings strongly advocated that the system of ocean tariffs be simplified. Surcharges must be justified and only then that its application will be made as a last resort. Further, such surcharges are temporary in nature and should not be extended permanently. THC and other surcharges are integral parts of the freight. Therefore, carriers should charge an “all in freight rate”, which includes the cost of basic freight, THC and all other surcharges, and be paid for by the party that pays the freight in accordance with the terms and conditions of purchase and sales agreement. The meetings agreed to continue their efforts to have an open dialogue with the carriers directly and through United Nations Economic and Social Cooperation in Asia-Pacific (UNESCAP) to find an amicable solution. A maritime regulatory system which promotes competition and fair trade practices as in the USA and Europe should be in place for Asian countries which are undergoing rapid economic development. The meetings agreed to leverage on the encouraging progress of different shippers’ councils in Australia, China, India, Singapore, Sri Lanka, Thailand and South Africa on maritime regulatory reforms and advised the other shippers’ councils to take similar actions. The meetings fully support the initiatives undertaken by their respective national governments in safeguarding the ports, waterways, ships and cargoes against terrorism. The safety of the world’s supply chain remains an important priority concern. The enhanced security measures benefit all parties in the supply chain that includes governments, carriers, terminal operators and other logistic service providers, and therefore each party should bear its own costs and should not simply pass on their costs to shippers. The meetings acknowledged the joining of Asian Shippers’ Council (ASC), as an Asian component to the Tripartite Shippers’ Meeting in San Francisco held on September 15-17, 2005. The meetings supported the role of ASC to represent, promote and defend the group’s views and positions at various international fora. Mr. John Y. Lu, Chairman of Singapore National Shippers’ Council (SNSC) was re-elected as ASC Chairman for another term. The meetings appreciate the valuable efforts of the Indonesian National Shippers’ Council (INSC) in the successful hosting of the 28th FASC AGM. Dr. Suardi Zen, Chairman of Indonesian National Shippers’ Council (INSC) will continue to serve as FASC Chairman. 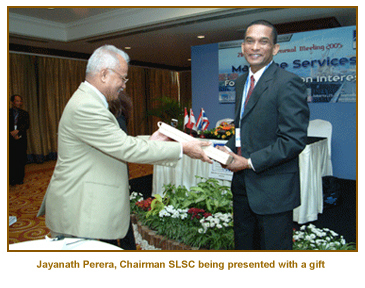 The meetings accepted the offer of Sri Lanka Shippers’ Council (SLSC) to host the 29th FASC Annual General Meeting and 3rd ASC Annual Meeting in 2006 in Sri Lanka. Dated this 27th day of September 2005 at Borobudur Hotel, Jakarta, Indonesia.